According to recent article in the Boston Business Journal, a technological innovation will allow partial and total knee replacement surgeries to be performed by a robotic arm. The company claims that this robotic arm sets them apart form companies such as Stryker, DePuy, and Zimmer. As your Boston knee replacement lawyer can explain, there have been many products liability lawsuits filed against the makers of these knees for issues involving defective design and a failure to adequately warn patients of known dangers. 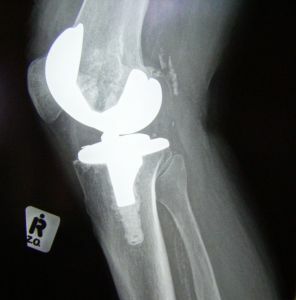 The robotic arm is intended to be used by surgeons to allow for a more precise alignment of the artificial knee components. This company is claiming that proper alignment is the difference between success and failure in a knee replacement procedure. The new device uses a 3D image of the knee and uses the image to saw off the knee joint at the proper place and at the proper angle. Without the use of the new robotic arm, surgeons use a metal guide and attempt to come within a few degrees of perfect alignment. The company also claims that if alignment is not proper, it can lead to a total failure in the replacement knee, and the patient will require another operation and another artificial knee to replace the failed one. Surgeons typically get the alignment right 75 percent of the time, and this robotic arm is supposedly able to get an exact alignment over 90 percent of the time. While this new technology seems promising, and we truly hope that it works as it is supposed to, there is no doubt that millions of Americans are undergoing surgery that they may have never needed in the first place, only to have a dangerous and defective artificial knee implanted that can fail and require additional surgery to replace it. This leads to pain and suffering and medical bills and more money for the makers of these potentially dangerous products. If you have had a knee replacement and now require an additional surgery to replace the failed knee, it is a good indication that you may have a case. While there is no guarantee, as the facts in every situation are different, if you are the victim of a failed partial or total knee replacement, you should contact a products liability attorney who regularly represents people in your situation. One of the major problems we see in these knee replacement cases is that companies are marketing their products to unsuspecting patients who are already in a lot of pain and told that this new knee will make them able to get around as if they were many years younger. They are not telling patients of many of the dangers and issues with the artificial knees that they know about or should know about, based upon the required testing for devise manufacturers. If you are the victim defective product in Boston, call the Law Offices of Jeffrey S. Glassman for a free and confidential appointment — 1-888-367-2900.